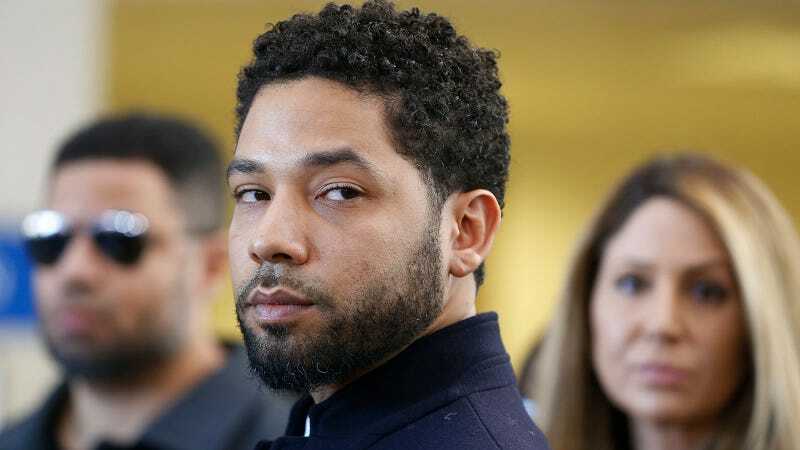 After a tweet from Donald Trump suggesting as much, NBC News confirmed that the FBI is looking into the particulars of the dropping of Smollett’s charges. However, NBC said that “expectations were low Thursday that any federal action would be taken.” Trump called Smollett’s case “outrageous” and “an embarrassment to our Nation!” I hate that I agree? I hate that so many right-wing people, with their varying prejudices and eagerness to deny the existence of hate crimes just for the sake of feeding their selfishness, now feel vindicated for doubting Smollett in the first place. It’s a terrible thing when bad faith is justified. Less than 4 million people tuned in to Empire on Wednesday (3.97 million to be exact, which is about 10,000 fewer than the previous week, the former series low). Page Six points out that Fox has not yet announced whether the show will be renewed for a sixth season. I haven’t watched Empire in years and have no idea what’s happening on it, but it couldn’t possibly be as riveting as The Jussie Show at this point, right? Tina Tchen has nothing to say!!! The former Michelle Obama aid who reached out to Cook County State’s Attorney Kim Foxx just days after Smollett’s supposed attack, citing concerns from Smollett and his family over the way the Chicago PD was handling his case, was spotted out by TMZ and she had nothing to say! Not word! No comment! No interviews! Nada! Go away! While it would be nice to hear what Tina Tchen makes of all this, as someone well-connected who spoke up on behalf of Smollett before his case turned and he was charged, I admire her resolution. Why don’t more people do this? Why don’t more people just not talk? It’s really useful when you’re trying to not make things worse! On Thursday’s Today show, Smollett’s attorney Tina Glandian suggested that Smollett may have mistook his attackers as white because they painted their faces before putting on their ski masks. (All sides agree that the attackers or hoax participants were Smollett’s associates Abel and Ola Osundairo, who are black.) “I was looking up the brothers, and one of the videos that showed up actually was of the brothers in whiteface doing a Joker monologue with white makeup on him. So it’s not — it’s not implausible,” said Glandian. Absolutely astounding. An idea that would have been laughed out of the Empire writers’ room was presented as a potentially true story. In fact, the mere stating of this idea by a legal professional on a national stage would seem implausible, except it really happened. Glandian really went on TV and really said that. Incredible. The idea that the Osundairo could be so skilled at creating a Caucasian complexion! Like White Chicks or something! I can never believe any of this is happening, and yet it all is. A terrific narrative experience.